, a learned Polish Protestant divine, was born Nov. 20, 1660, at Dantzic, and had the first part of his education in Germany; after which he travelled into Holland, and thence to England, for further improvement in his studies. Thus accomplished, he became successively minister of Magdebourg, Lissa, Koningsberg, and Berlin, and was at length ecclesiastical counsellor and president of the society of sciences in this last city. His zeal against infidelity, both in the atheists and deists, shewed itself on all occasions; and he took a deal of pains to effect an union betwixt the Lutherans and Calvinists, but to no purpose. The truth is, considering the rooted prejudices on each side, such a coalition, like that between the church of England and the Dissenters, is rather to be wished than expected. 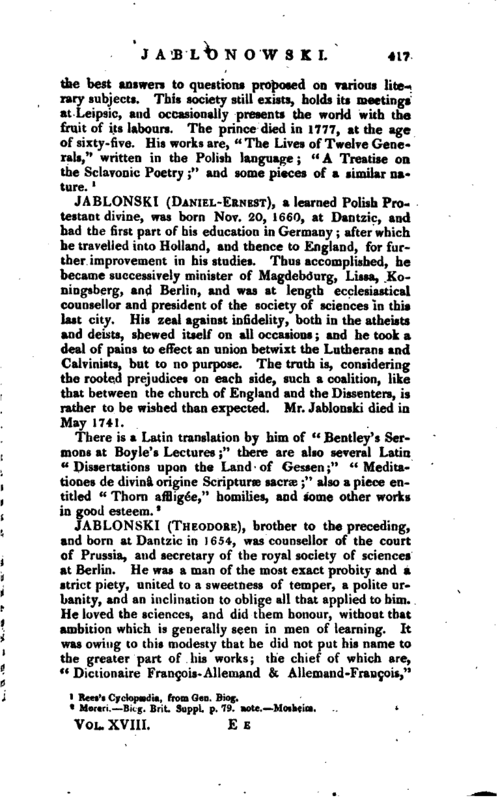 Mr. Jablonski died in May 1741.